Personalise this Gold Stars Chocolates Bar with 3 lines of text on the front up to15 characters per line and 3 lines on the reverse up to 20 characters per line. All personalisation is case sensitive and will appear as entered.Due to the nature of this product and the font type used please refrain from using all capitals in your personalised message. If the message is all in capitals you will find the personalisation extremely difficult to understand and may even result in personalisation being missed off the product. 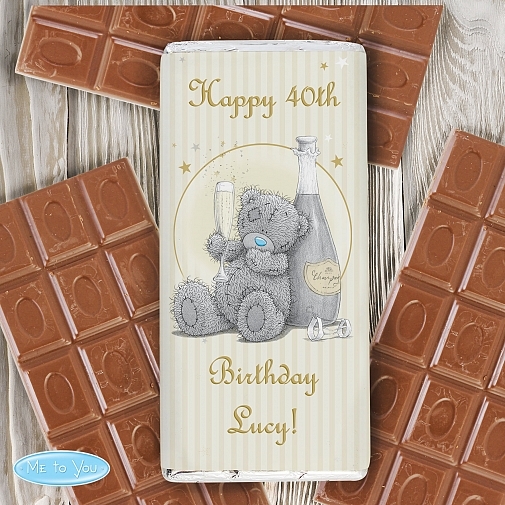 Many thanks for your cooperation.What's more our great value Chocolates includes free standard delivery and are available on next day.Milk Chocolates Bar15cm x 7cm x 1cmWeight 100gMay contain traces of nutsPerfect for Wedding, Anniversary, Engagement, Birthday, Graduation.